After years of poorly planned & executed Superman stories (see this week's Action #805 for a sterling example), Birthright, in its very first issue, delivered a powerful one-two punch knockout to the creative malaise plaguing DC's Superman franchise. Strong words, I know…but the impact I felt from this first chapter was profound and, like the aforementioned one-two punch, can be broken down into two distinct aspects. The first aspect is how the comic book itself was crafted. Literally every aspect of this comic book was enjoyable to me, both in it's production values (a very attractive total package) and, of course, the outstanding effort by the creative team. Mark Waid, as much as I've been busting his chops over his Fantastic Four work, has returned to the style of writing I've always associated him with: a thoughtful, well-constructed marriage of high-concept wonder and emotionally resonant character interaction. 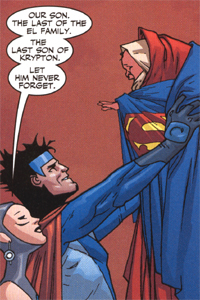 Though he retained the general outline of the classic origin story, Waid adds a new twist by portraying Jor-El and Lara's collaborative effort to see their son to safety. As a married man, I appreciated Lara's determination to see him through doubt and despair and to help him focus on their last act as parents ("He needs our courage!"). They're truly a team here, not the rather lop-sided presentation of previous decades, where Lara either stood helplessly in the background or, in the case of the Byrne version, offered only resistance and confusion. Another innovation is the degree of uncertainty exhibited by Jor-El and Lara leading up to Kal-El's escape. They did all they could to get him to safety, but were still not quite sure it would work. This, added to the readout of the rocket's depleting power supply, powerfully communicated a renewed sense of danger and desperation to Kal-El's voyage. On a minor note, a slap on the back to Waid for incorporating the "S" shield insignia as the El family crest, an act 25 years overdue (since the crest's brilliant usage in the '78 Superman movie). As in the movie, the connection to his heritage gives the symbol a meaning it's never really had in the comics before. Bravo. The African sequence was also a pleasant surprise. Ripped from its true context, the Birthright preview in Wizard magazine didn't impress me much, and made me wonder about where Waid would be going with all this. After reading the story and seeing how he subtly wove the themes of heritage and identity into the dialogue, my faith in Waid is restored. It's not going to be a "traveling social worker" schtick, but rather a carefully crafted "roadmap" showing when and where Clark may have reached important turning points in his journey towards becoming Superman. Everything Krypton. Though we were only given a glimpse of that culture, I loved everything about the design of Kryptonian society, present and past. Echoes of Mobius, but, once again, uniquely the work of Yu and Alanguilan. The thrilling "toggle view" between the speeding rocketship and the speeding bullet on page 15. Absolutely brilliant, and one of most perfect transitional scenes I've ever seen. Worth the price of admission right there. Clark's design. Though I was initially not very happy about the look, I've grown to really appreciate it. Clark really IS in his early 20's and looks the part. He's not the rather bland 70's kid from the Jurgens era, or the massive McGuinness Michelin Man….just a good looking kid you might see anywhere.